I have written in the past about our chickens which we keep for eggs and general amusement, but I don’t think I have written much about our garden. Gardening is very important to our family. First, it provides our family with organically grown healthy food with no creepy pesticides or exploitative labor. While we do not grow enough to be entirely self sufficient, when the summer garden really gets going we can hold our own pretty well, and then we supplement with fruits from the farmer’s market. Second, its bit of a zen activity for my hubby. We have been slowly transitioning the yard from decorative to edible, we have onions growing along our front walk way and tomato plants here and there in the back yard that we planted when other plants died off. We have not gone so far as ripping out the lawn (the chickens have done that for us), but we are being opportunistic about planting something that will produce something tasty when we can. 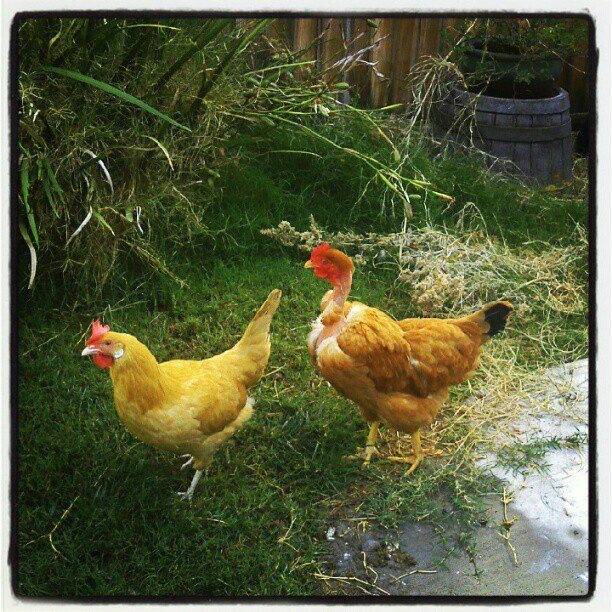 I am learning that the chickens are also big fans of the garden, meaning they want to chow down on the plants. Now before you call me crazy for not having thought about this, in my defense, the chickens coexisted and even nested under some of our tomato plants and did not give them a second look…however this year they have decided that the plants are delicious and have been relentless in their pursuit of them. We put up fencing, and they scoot through it, or under it or sometimes the cat knocks it open and they saunter right on in. Today I learned that while I was upstairs folding laundry and excavating my closet, the chickens made their way into the garden and at my cucumber plants. Then, when they were done they set up shop next to the back door and hound me for a treat. Each year the garden is an experiment, an ever evolving project that we tweak and toy with. This year’s experiment will center around chicken proofing. Or stew. And thats the farm report. We do use CP in the garden, by way of our composter though, I dont deposit it directly. Hay versus Shavings: Hay gives you “off the grid” street cred. No one has hay in the suburbs unless you are up to something, and I like being up to something. Shavings has all the cachet of keeping hamsters or guinea pigs. However, I use shavings. We were going to go the hay route, when we were first planning the coop..back then it was going to be tall enough that we could stand in it and then using hay made sense. In the end, the coop we ended up getting was substantially smaller and is situated on cement, so the only place where we needed bedding would be in the nest box/sleeping area and that could easily be taken care of with shavings. I have not noticed any problems with the shaving breaking down (or not breaking down) in the composter. It might be a matter of size though. When I clean out the coop, I am only getting about a grocery bag (maybe two) worth of mess going into the compost. I suspect that it would break down faster than a wheelbarrow’s worth. Chicken Advisor, Im going to add that to my CV.